Gun lockers are available in several sizes and keep handguns safe and secure. Today more than ever, gun safety has become an issue that is impossible to ignore. American Metal Crafters can supply the peace of mind that guns will not fall into the wrong hands with our line of affordable, tamper-resistant gun lockers. Nearly 7,000 violent crimes are committed each year by children using guns they found in their own homes. Thousands of gun-related accidents involve children every year. Accidental shootings are one of the leading causes of death for children under 14 years old. American's gun lockers will help keep handguns out of sight  and out of reach  from children and other potential unauthorized users. American's gun lockers are available in several colors and are equipped with three-wheel locks. The codes for the locks are set by each individual user, allowing them to be changed at any time to maintain security. 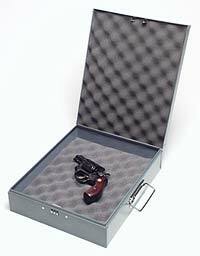 For more information, see the product description for our gun lockers. Three-wheel lock combination can be changed at any time to maintain security. Call our Sales Department today at (860) 343-1960, or toll-free at 1-800-840-9243, to discuss your gun locker needs, or fill out our online form to receive more information.